Spring-assisted opening permits one-handed operation. 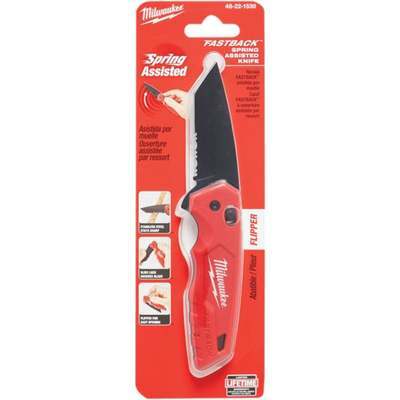 Black oxide-coated stainless steel serrated blade maintains long-lasting sharp edge. Serrated blade is ideal for tearing through material, and the tanto tip is ideal for plunge cuts. Liner lock secures the blade in the open position. Slim compact body stores easily yet withstands job site abuse. Reversible wire-form belt clip allows for storage on a belt or in a pocket without fraying the fabric.